FREE BAPTIST SERMONS are collection of baptist sermons. These Free Baptist Sermons are snippets from baptist sermons that can be used to gather ideas to develop baptist sermons for your congregation. These Free Baptist Sermons are available to be used to get ideas in preparing sermons for your people. Discouragement! Perhaps you have been there. Many good people have. I was reading recently about a young lawyer who descended into the valley of despondency. Things were going so poorly for him that his friends thought it best to keep all knives and razors away from him for fear of a suicide attempt. In fact, during this time he wrote in his memoirs, "I am now the most miserable man living. Whether I shall ever be better, I cannot tell. I fear I shall not." The young lawyer who unleashed these desperate feelings of utter hopelessness was none other than Abraham Lincoln. In 1 Kings 19, the life of Elijah provides some insights into conquering discouragement. To conquer discouragement, we must realise the causes, recognise the consequences, and receive the cure. At the same time, we must never forget that God cares for us and He is always there for us. As He has promised, I will never leave you nor forsake you (Joshua 1:5b and Hebrews 13:5b). For more information on this sermon, click on Free Baptist Sermons From 1 Kings 19. Mickey Mantle, an almost mythical baseball star who feared he had failed to fulfill career expectations because of alcohol abuse and whose recent years were haunted by self-recrimination, died of cancer early Sunday. He was 63. The former New York Yankees center fielder and a member of baseball’s Hall of Fame said at a July 28 news conference that he had squandered a gifted life and warned admirers he was no role model. “God gave me the ability to play baseball. God gave me everything,” he said. “For the kids out there, don’t be like me.” (Los Angeles Times, Monday, August 14, 1951). What makes a godly role model? What makes a vessel of honor for God’s service? Well, the apostle Paul gave some hints when he encouraged Timothy to strive to be a godly role model. In short, it begins with a cleansed life—a life that shuns sinful activities and those who propagate sinful activities. At the same time, it involves a sanctified life—a life committed to God and His service. In many ways, a godly role model is someone who has put his life totally in God’s hands—allowing God to mould and shape his life to the honor of God. Will you allow God to mould and shape your life for His honor and service? For more information on this sermon, click on Free Baptist Sermons From 2 Timothy 2:20-26. In Mark 7:6-7, Jesus said, “This people [referring to the Pharisees] honours Me with their lips, but their heart is far from Me. And in vain they worship Me.” What was Jesus saying? Jesus was saying that they lived a life of pretence—saying one thing and doing another. Oh, how the Pharisees needed to learn to shed the mask of pretence! In many ways, we must learn to avoid the mask of pretence because we too can subtly fall into living a life where we honour God with our lips but our hearts are far from Him. The writer to the Hebrews urged his readers to shed the mask of pretence by allowing the living word (4:12) and the living God (4:13) to minister in their lives. When God and His word are active in our lives, the mask of pretence is no longer needed. Carl Lundquist in “Silent Issues of the Church,” writes “Henry Wingblade used to say that Christian personality is hidden deep inside us. It is unseen, like the soup carried in a tureen high over a waiter’s head. No one knows what’s inside—unless the waiter is bumped and he trips! Just so, people don’t know what’s inside us until we’ve been bumped. But if Christ is living inside, what spills out is the fruit of the Spirit.” If our lives are marked by pretence, may God encourage us to shed that mask of pretence for the living Christ! For more information on this sermon, click on Free Baptist Sermons From Hebrews 12. There was a contractor who was bidding on a job. While waiting alone in the office of his prospective client, he noticed under a jar on the desk a copy of the competitor’s bid. However, he could not see the numbers because it was partially covered by the jar. So, he decided to lift the jar to sneak a peek. As he lifted the jar, hundreds of BB’s spilled out from the bottomless jar all over the desk and floor. Temptation! We all face temptation. But how do we deal with temptation? How do we resist deadly temptation? 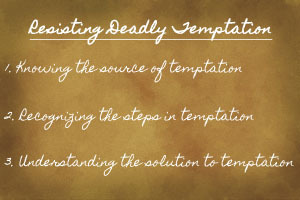 After all, “It seems we can resist anything but temptation.” Well, we can resist deadly temptation by understanding the source of temptation, the steps in temptation, and the solution for temptation. The apostle Paul summed it up when he wrote these words: “No temptation has overtaken you except such as is common to man; but God is faithful, who will not allow you to be tempted beyond what you are able, but with the temptation will also make the way of escape, that you may be able to bear it” (1 Corinthians 10:13). May God and His word guide us in resisting deadly temptation! After all, we have the victory in Jesus Christ! For more information on this sermon, click on Free Baptist Sermons From James 1. We live in a world of competing voices. Everyday we are bombarded by various voices telling us how to live, what we need to buy, how we should spend our time, etc. These voices are real and powerful. Above all, they want us to listen and do as they say. However, there is one voice that is different from all other voices. Of course, I am referring to the voice of God. God still speaks today through His word. But are we listening to God’s word or are we listening to the competing voices? When the word of God came to John, he spoke about sin, he spoke about repentance, and he spoke about the Saviour. The reason he spoke on these topics was because people needed to understand how they could enter kingdom of God. Would they listen to God’s spoke-man? You know, we too need to listen to God’s word. After all, it tells us how we can enter the kingdom of God. Sin stops us from entering God’s kingdom. However, if we repent and turn to Jesus in faith, God forgive us for our sins and opens the door to His kingdom. May we heed the word of God and enter His glorious kingdom. May we heed the word of God and live faithfully as subjects of His glorious kingdom! For more information on this sermon, click on Free Baptist Sermons From Luke 3.